Awhile back I wrote a post about Japanese idioms called 「慣用句」 (“kanyouku“). ● 「ゴマすり」 (“Gomasuri“) which literally means to grind sesame seeds…but the meaning of the expression is to “brown nose” (which itself is an idiom in English). 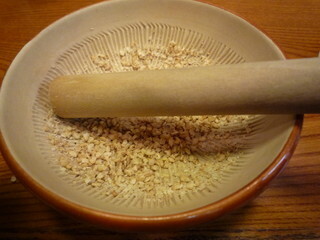 A "suribachi" and "surikogi" are tools to actually grind sesame seeds in Japan. But there is another type of idiom in Japan called 「四字熟語」 (“yojijukugo“). This type of expression originated in China and uses four characters to give advice in a simple poetic form. I’m not sure how it is in the Chinese language (since I can’t speak Chinese at all) but this type of idiom doesn’t actually follow proper Japanese-language grammar…but that’s part of what gives them their simple poetic charm. What I want to do with this blog post is a type of game using five famous Japanese yojijukugo idioms. You don’t need to know how to read or understand Japanese. I will write the five idioms and give the literal meaning of the four characters that comprise each expression. In the comments section of this post, try to guess the English equivalent of each Japanese idiom…and then come back to this post and read the answers which I will have at the bottom of this post. Try to guess what each expression is in English before you read the answers! The literal meaning of the characters should give you a hint. 1. 「一石二鳥」 (いっせきにちょう)…literal meaning: “One stone, two birds“. 2. 「十人十色」 (じゅうにんといろ)…literal meaning: “Ten people, ten colors“. 3. 「七転八起」 (しちてんはっき)…literal meaning: “Seven stumbles, eight (times) get up“. 4. 「異体同心」 (いたいどうしん)…literal meaning: “Different bodies, same heart“. 5. 「自画自賛」 (じがじさん)…literal meaning: “Own picture, self congratulate“. OK. Do you think you’ve figured out the English equivalent to these Japanese idioms? Click here to go to this post’s comment section and write your guess. And then after you’ve guessed what you think the English is for these Japanese idioms, come back to this post and read the answers at the bottom of this post. Did you write a guess in the comments section? 1. 「一石二鳥」 (いっせきにちょう)…literally: “One stone, two birds”…meaning: “Kill two birds with one stone“. 2. 「十人十色」 (じゅうにんといろ)…literally: “Ten people, ten colors”…meaning “Different strokes for different folks“. 3. 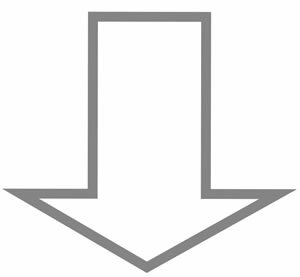 「七転八起」 (しちてんはっき)…literally: “Seven stumbles, eight (times) get up”…meaning “Never give up (or “Fall down seven times, get up eight”). 4. 「異体同心」 (いたいどうしん)…literally: “Different bodies, same heart”…meaning “Two people in one accord“. 5. 「自画自賛」 (じがじさん)…literally: “Own picture, self congratulate”…meaning “Tooting your own horn“. Idioms 1, 2, 4 and 5 are also traditional Chinese idioms. Idiom #3, however, won’t be too much of a stretch for Chinese-speakers to guess at because 転 and 起 already have the same meanings in Japanese and Chinese. The real fun, of course, are your English idioms, which are very close or spot on. >The real fun, of course, are your English idioms, which are very close or spot on. Do you mean my literal translations of the kanji characters? Or the actual English idioms with similar meanings as the Japanese ones? Having lived in Japan a few years now, I’ve had different experiences with some of these. Actually, “Nana-korobi-ya-oki“, as you wrote, is the more common pronunciation for that expression. But “Shichi-ten-hakki” is acceptable too. I suppose I should’ve written it the more common way. These two are very similar. Almost the same. All of them. Nos. 2 and 4 aren’t strictly in the Chinese mould word-wise, though not entirely remote to be unintelligible. To further confuse people, the Cantonese have similar axioms but uses different Chinese words from the rest of the country. Really? How are they different from Chinese style? #2 (and 1 and 3) are probably the three most well-known of this style idiom in Japan. I know that China uses two different versions of kanji characters. I wish I knew how to explain in writing. I recognise some Chinese/kanji characters, but in actuality I cannot read or write Chinese. I’ll try with transliterations, so bear with me. For No. 2, the usual Chinese phrase would be “kok yan kok foon” (at least in Cantonese), as in “every person, every way” = each to their own. Mandarin might be slightly different, but not too much. For No. 4, it’s usually 二人一心 (two person, one heart) – but there are variations, depending on the context, such as 統一戰線 (together in a united front). Umm, actually, that doesn’t look too helpful to explain. Never mind. Well, Chinese and Japanese are quite different languages. Actually. those are pretty good guesses, I think. Thanks for trying! You got the first one correct and I think your guess for #4 is pretty close. Nice! I knew a couple of those, but I’m glad to learn ゴマすり. Cool post. You didn’t know “goma-suri” (“brown-nose”) already? Were you able to guess the meanings of the others from my hints? Interesting… I’ve never heard any of them, but then again my mother would not use those with me because I have a hard enough time with simple Japanese. I’ll have to mention these to her just for fun though. I’m sure your mother knows these idioms. They’re well-known.